Amicus Productions take their second trip through the EC Comics catalogue. 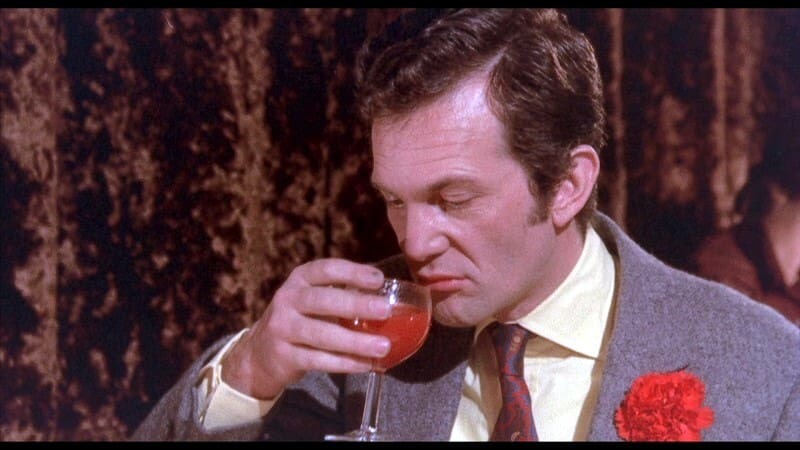 RICHARD PHILLIPS-JONES visits The Vault Of Horror (1973). STARRING: Daniel Massey, Anna Massey, Terry-Thomas, Glynis Johns, Curt Jurgens, Dawn Addams, Michael Craig, Edward Judd, Robin Nedwell, Geoffrey Davies, Tom Baker, Denholm Elliott, Terence Alexander. 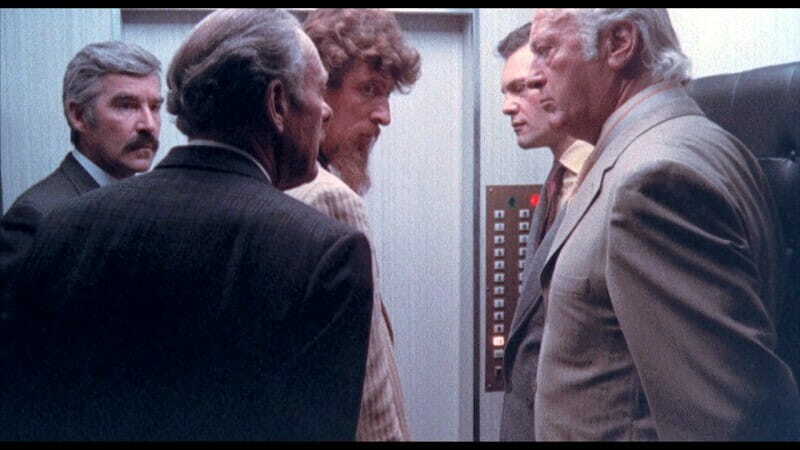 In a tall office building, five men from different floors enter the same lift, expecting to make their exit. Instead, the lift malfunctions and the group find themselves in what seems to be some kind of club room in the sub-basement. Following the great box-office success of Tales From The Crypt (1972), Amicus took another delve into the EC Comics archive, with Milton Subotsky once again adapting five of their tales. With Freddie Francis unavailable, Roy Ward Baker took over directorial chores on this occasion. Baker’s genre work has its detractors, but I’m a bit of a champion of his horror efforts. To me, he always seemed to take a more modern, matter-of-fact approach to the material, making for an interesting contrast to the more classical, nightmarish-fairy-tale treatment of others in the British horror realm. 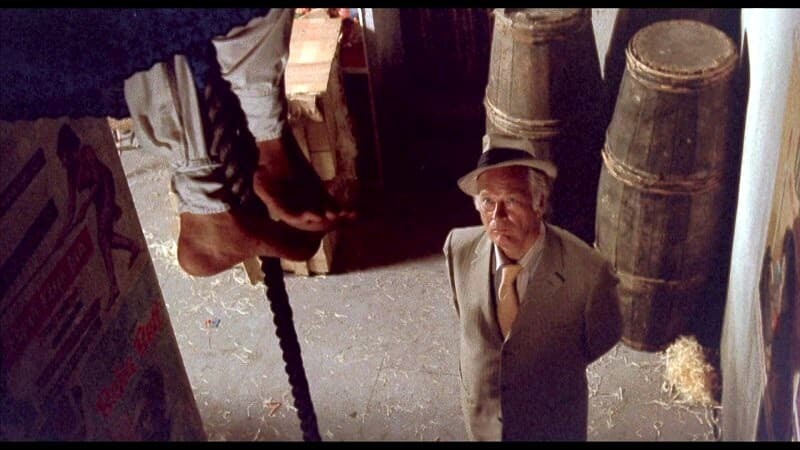 Baker’s approach paid real dividends for Amicus in Asylum (1972). With a notable lack of a bona fide horror star in the cast this time around, Baker turns this in the film’s favour and grounds the stories more in contemporary reality, complimented by some interesting, not too obvious casting choices. Take real-life siblings Daniel and Anna Massey in the opening segment. Anna’s earlier appearances in Peeping Tom (1959) and Hitchcock’s Frenzy (1972) notwithstanding, the two would normally be associated with more prestigious television and stage work. If you also consider that they reportedly had a frequently fractious off-screen relationship, it certainly adds an interesting dimension to the action on-screen. 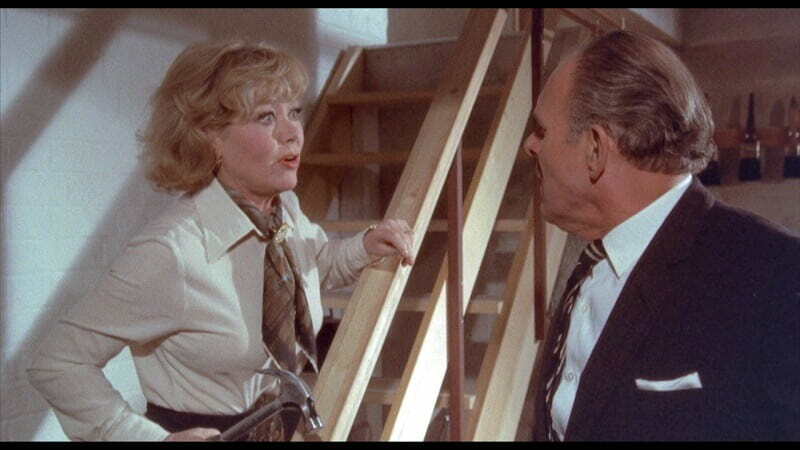 Terry-Thomas gets an opportunity to avoid his usual upper-class cad typecasting, with a genuinely irritating turn as the meticulously neat Critchit, and it’s still hilarious to see Glynis Johns (yes, Mrs. Banks from Mary Poppins) reaching the end of her tether with him and blowing a gasket. 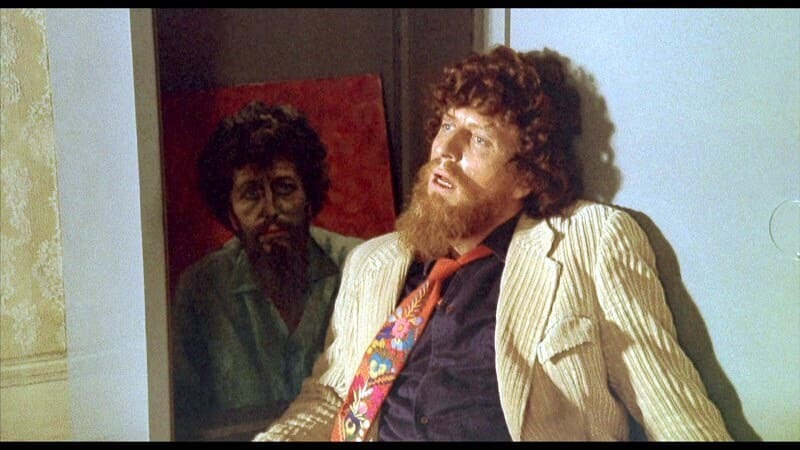 Then there’s Tom Baker, fascinating to see on the cusp of making his debut as Doctor Who the following year. Whether it quite reaches the high bar set by its predecessor can be debated ’til the cows come home, but that’s really nitpicking. 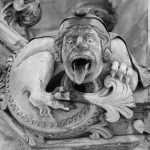 With some memorable turns, and story endings which have stuck firmly in the minds of all who watched it growing up, The Vault Of Horror remains a Brit-horror classic. TRIVIA POINTS: The medical students in the Bargain In Death segment were played by Robin Nedwell and Geoffrey Davies, stars of the long-running Doctor series of sitcoms (1969-77) on ITV. A brilliant in-joke at the time, it would sadly have been lost on audiences in countries where the series wasn’t shown. 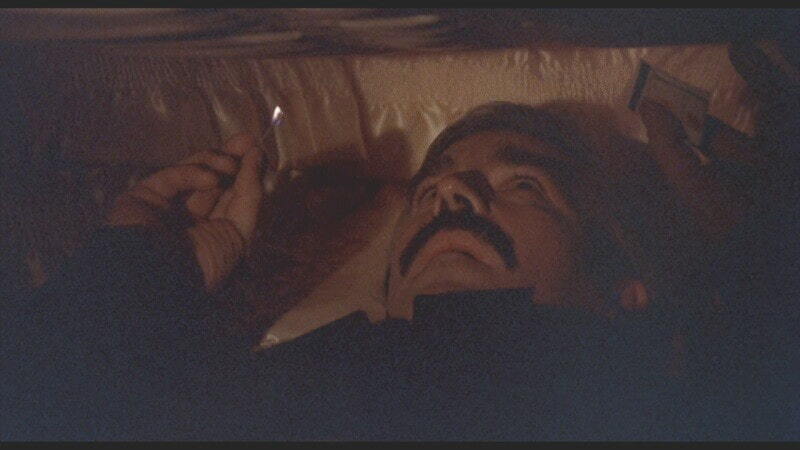 In the same segment, Michael Craig can be seen reading the novelisation of Amicus’ Tales From The Crypt (1972). This is the only Amicus portmanteau film in which Peter Cushing does not appear. It is rumoured that Dawn Addams was not available for post-production loop work, and so was redubbed by Honor Blackman. The film was cut to achieve a PG rating in the USA, and it was this version which circulated most commonly for many years. Thankfully, the uncut version resurfaced and is currently widely available on Blu-ray. 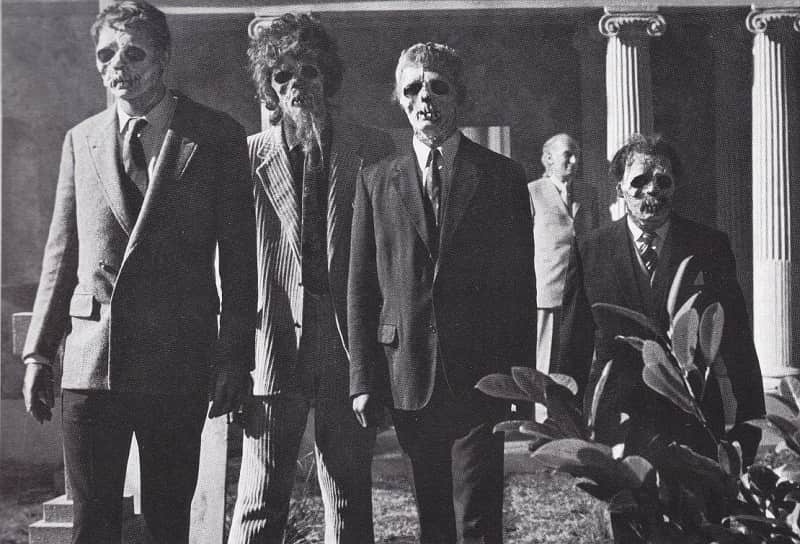 FOOTNOTE: Photos exist of a scene showing four of the storytellers depicted as walking corpses. It remains debated whether the scene was actually shot or just posed for publicity purposes. The fact that Curt Jurgens is replaced by a stand in suggests the latter, but we may never know for sure. The League of Gentleman 2000 Christmas Special – Yule Never Want to Leave! Creepy serial killer fest from masters of horror Freddie Francis and Robert Bloch!